Blind Date Ideas – For Your Spouse! That’s right, you read it correctly, these are all fun blind date ideas for your spouse! How exactly do you plan a blind date with your spouse? You’ve known each other forever so what’s so blind about it, right? Well, the date ideas themselves are the mystery – not the identity of the person you’ll be dating! This idea is really easy to put together and you can let your imaginations run wild with this one. To start you’ll need some large empty envelopes or boxes (shoeboxes work great). The idea is to create a “date in a box” but leave the contents of it a mystery. Instant blind date ideas! Each package can have be labeled with a special clue word or phrase like “Action”, “Out of This World”, etc. and then the contents of the date idea box will be centered around this theme. I’ve put together a few samples of blind date ideas below to help get your creative juices flowing. The contents of the boxes can be filled with items around the house, small items from your local dollar store or department store, recipes to try together, etc. You can also rent items from your local library! Your local retailer likely has a sale bin for DVD’s so this would be a great place to go to find inexpensive DVD’s for your date boxes. When planning to use one of the blind date ideas, it’s best to ask your partner to choose a box the night before the date (don’t let him or her open the box yet) so you have time to get everything prepared before date night (shop for the ingredients for recipes, rent a movie from the library, set up the activity, etc.). Make a note for yourself so you remember what you’ve packed inside each of these mystery boxes. Campout: In this box you could include items to make a blanket fort (sheets, clothespins, etc. ), an indoor lantern with batteries, supplies for making s’mores and a spooky movie. 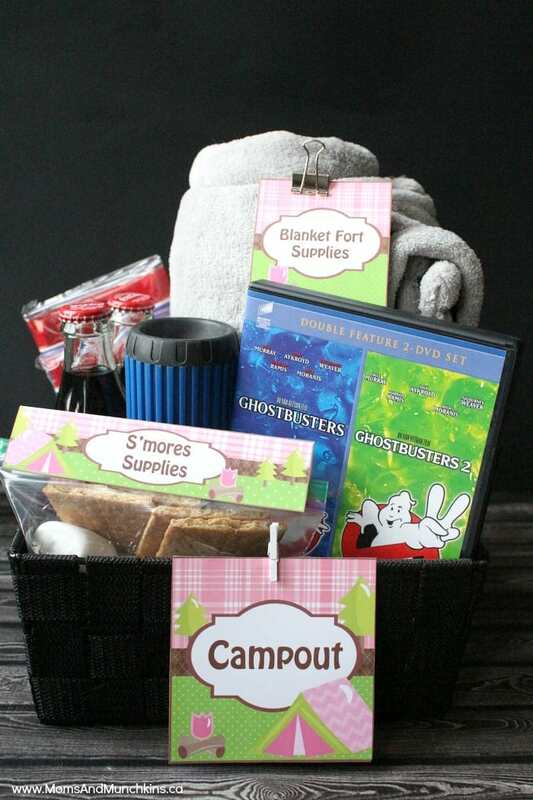 Check out this Campout Date Night for more ideas and FREE printables! 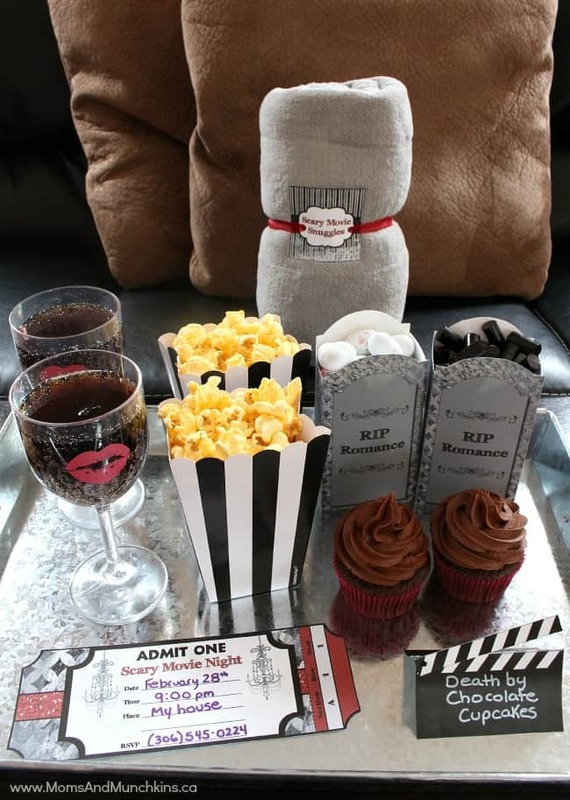 Romance: In this box you could include a romantic movie, candles, wine glasses, a bottle of wine, a blanket for cuddling plus movie night snacks. 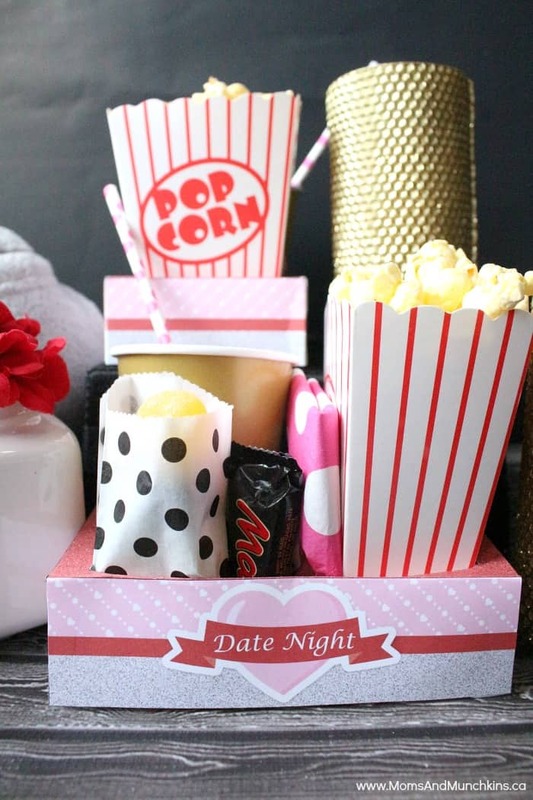 Check out this Romantic Date Night for more ideas plus FREE printables! 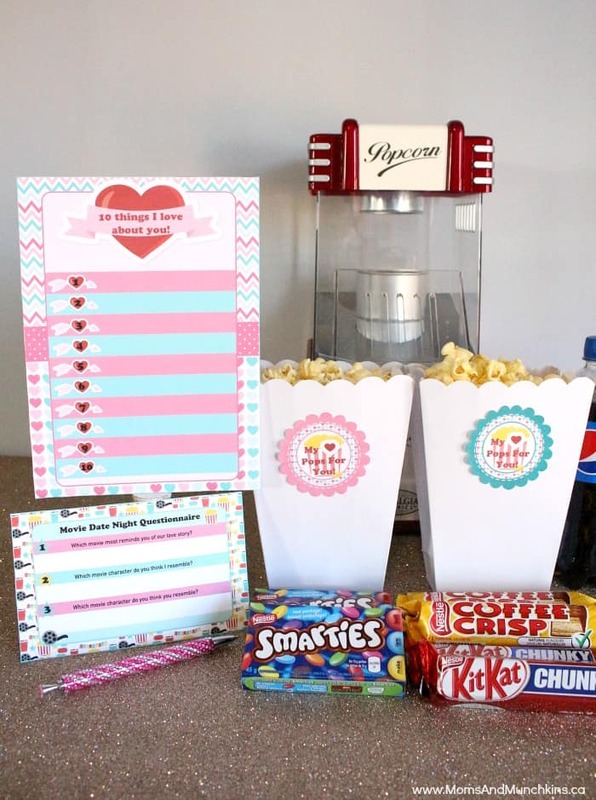 Movie Date Night: In this box you could include a movie, movie night snacks, and free printable quizzes about your relationship – see the free printable package here! Skinny Dip: In this box you could include chocolate for a fondue, fondue forks and make yourself a note to buy items for dipping like cake pieces, fruit, marshmallows, etc. Something extra special would be to book a local hotel suite so you could go swimming or soaking in a hot tub. Explosive: In this box you could include an action movie, a silly “explosive” science experiment, a recipe card for a spicy dinner, and candy like Pop Rocks to go with your movie. 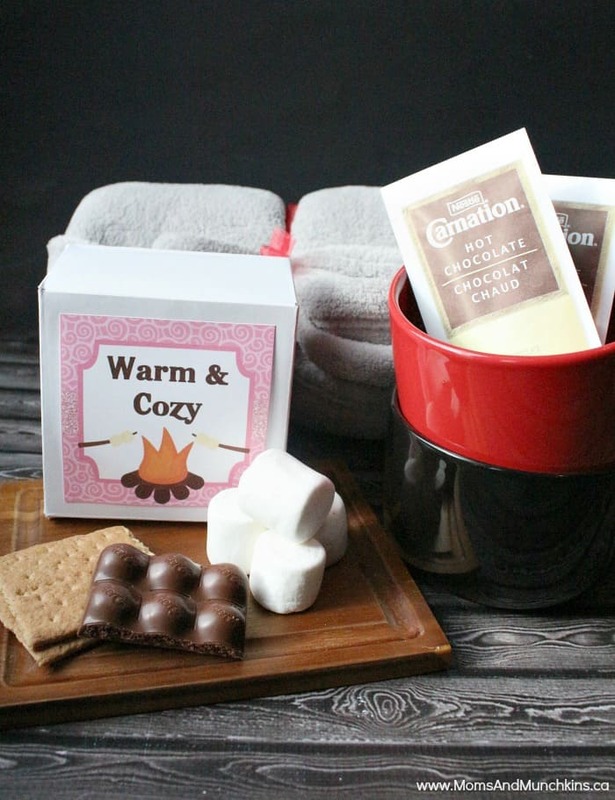 Warm & Cozy: For a cold winter day, you can pack away a blanket, hot chocolate, and supplies for indoor s’mores. Check out more indoor winter date ideas here. Adventure: This date night could start with a romantic scavenger hunt (here’s a free printable), that ends with directions to a restaurant you’ve never tried before or an action movie with movie night snacks. Perhaps a blindfold for a mystery taste test – you’ll want to do some grocery shopping for foods you’ve never tried before. Game On: In this box you could include some easy sports games at home like mini hockey sticks and a ball, a small indoor basketball net, and items for a concession stand like popcorn, candy, pop, hot dogs, etc. 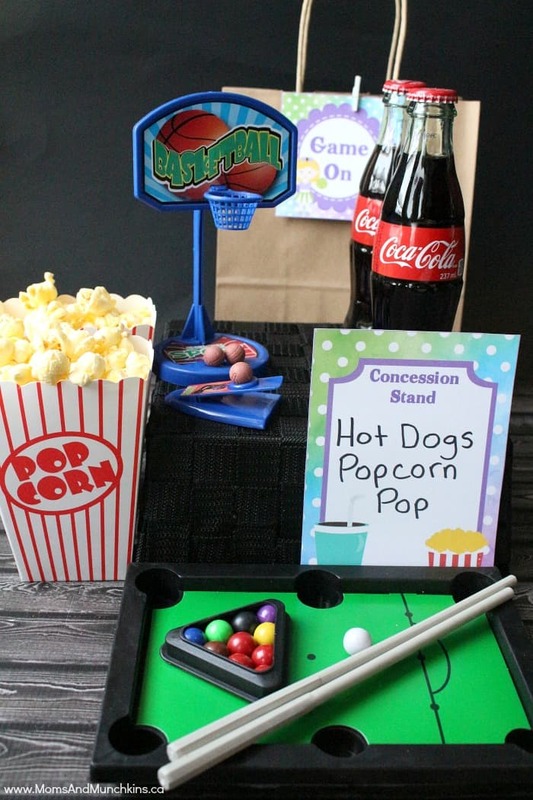 Check out this sports date night at home post for more ideas plus FREE printables! 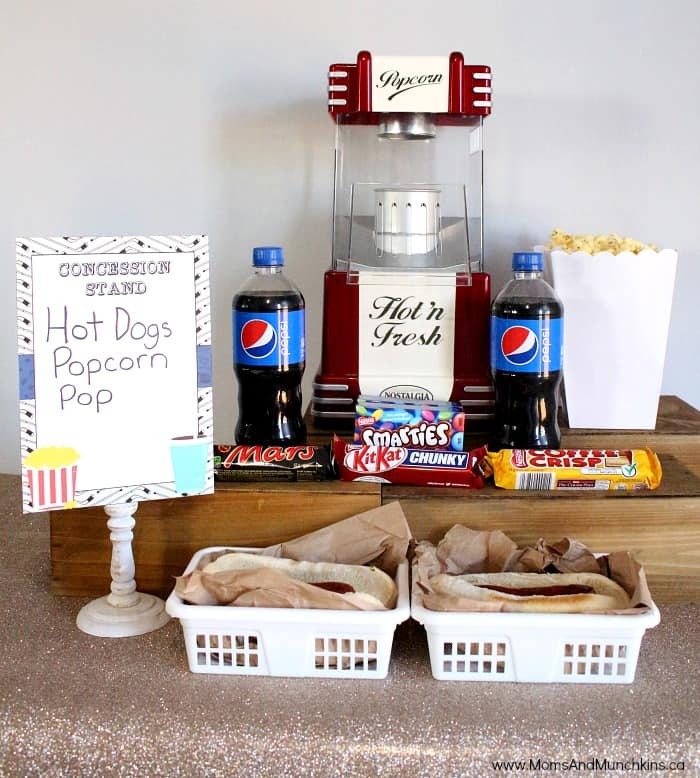 Hockey Date Night: In this box you could include a couple of mini hockey sticks, concession stand candy and a hockey trivia game – grab all the free printables here! Comedy: In this box you could include a comedy movie, a book of jokes, silly riddles to solve around the house, movie night snacks and a fun quiz game about your relationship. 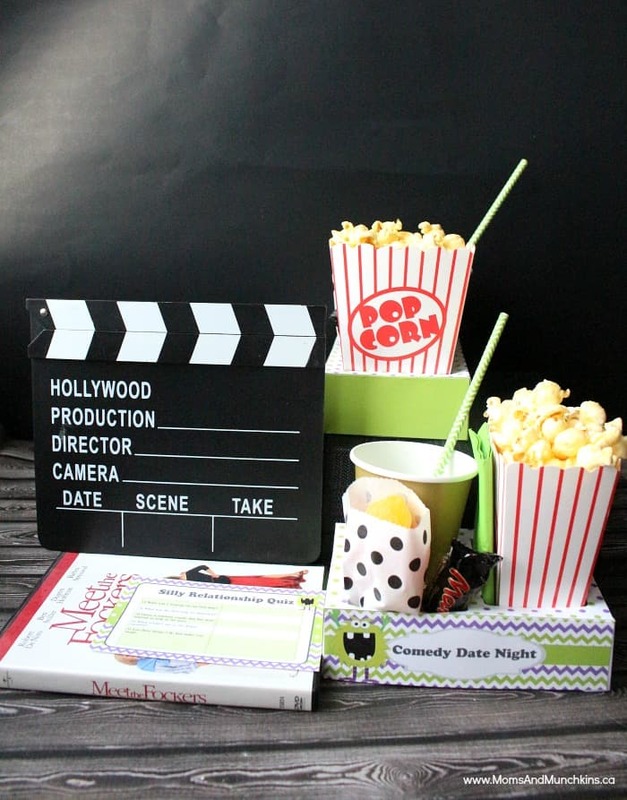 See more fun ideas for your comedy date night here with FREE printables! Out Of This World: In this box you could include a picnic of late night snacks, a blanket and a note to drive out of the country for some stargazing. If you have a telescope, bring it with you! 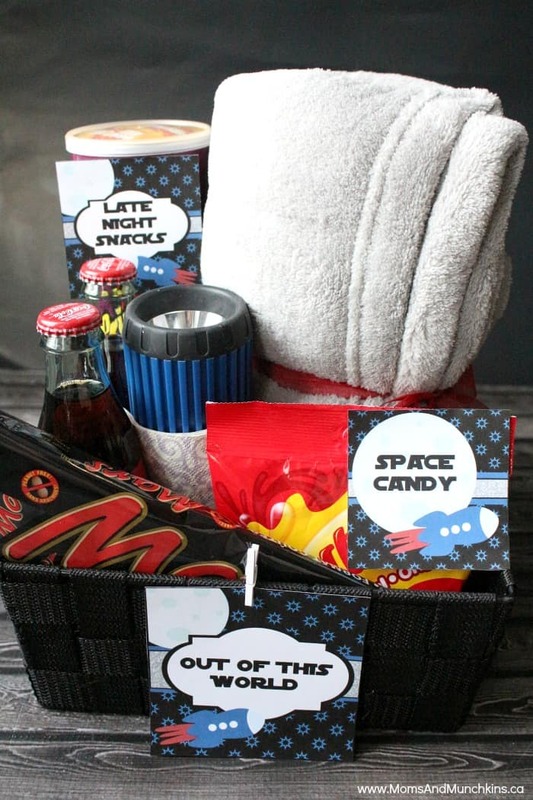 Check out this Out Of This World Date Night post for more ideas and FREE printables! Scary: In this box you could include a scary movie, movie night snacks, a blanket for cuddling, etc. We have a printable date night set for this idea – read all about it here. What blind date ideas do you look forward to creating? These blind date ideas would be a perfectly unique gift for Valentine’s Day or a birthday! For even more date ideas with FREE printables, visit our Date Night page. We’re always adding new fun activity ideas for all ages. Stay updated on the latest ideas by following us on Facebook, Twitter, Pinterest and plus sneak peeks on Instagram.